As a reporter, editor or writer for more than a dozen publications, as well as editor of a woman’s magazine in Colorado, I’ve had the opportunity to interview a lot of women. From women like Gloria Steinem to several U.S. senators, to well-known authors to politicians and more and I have to say I did one of my very favorite interviews this spring with one of the most inspiring, funny and full-of-chutzpah women I’ve met in a long, long time. You may have heard of her – her name is Victoria Trabosh. Trabosh is an international speaker, executive coach and columnist. She is also the co-founder of the Itafari Foundation, a non-profit organization created to assist survivors of the genocide in Rwanda. 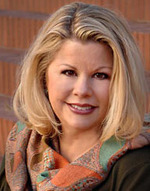 The first time I met Victoria Trabosh was during one of the first Girls, Inc. events – http://www.girlsinc.org/girls-inc.html – “Power of the Purse” dinner and auctions. I was taking photos of the purses that had been created by local designers for local “purseonalities” and Trabosh was one of the few personalities standing in person, in front of the purse that had been designed for her. I talked with her briefly after taking her photo and the first thing that struck me was that she didn’t really want to talk about herself. What she really wanted to talk about was Girls, Inc. and how impressed she was by the work they did. On the heels of that thread of conversation she wanted to talk about an organization called Itafari. She had just returned from Rwanda and she was incredibly inspired! She wanted to tell me about the children of Rwanda, and how she was accomplishing her dream to help them and to bring about the creation of a foundation to that would be instrumental – albeit one brick at a time as she likes to say, that thousands of lives of children have been saved and improved through the programs that Itafari serves. The color of the Rwandan soil, the red brick serves to remind us how simple change can be. A simple building block inspires us to take even the smallest step toward healing our world, and rebuilding the foundation of a country torn apart by fear, hatred and ignorance. More than a decade after the Rwandan genocide claimed nearly 1 million innocent men, women and children, the country continues to struggle against crushing poverty, starvation, disease, and an overall lack of justice. People of conscience throughout the world have begun to realize that this wasn’t solely Africa’s problem, and that any human rights violation impacts us all. And from that place of consciousness and compassion, the Itafari Foundation was born. I met Trabosh again a year or so later at an event hosted by Nancy Thompson of Flourish. http://flourish-pdx.com/archives.html She was attending one of Thompson’s Flourish events to hear photojournalist Paola Gianturco http://www.womenwholightthedark.com/ speak about her work in the world. Again we talked briefly and I was struck by her charisma, her humility, her enthusiasm and her spiritual sense – her love for the children of Rwanda and her allegiance to do everything she could do to help them. I asked her at that meeting about 9 months ago if I could interview her, which I did admitting at the time that I wasn’t sure where or how I would use the interview, but I felt compelled to speak with her. We sat for about two hours over coffee and I felt so much “good stuff.” You know how some people just ooze good juju – because of who they are, what they’ve done in the world and what they still dream of doing. And her sense of humor and honesty resonated with me. Then she told me about her book … “Dead Rita’s Wisdom.” Of course we had to talk about that at length. I had a visceral reaction to the book title somewhat like ‘I just don’t know if you’re supposed to call someone … maybe especially your mother …by their name prefaced by dead … even if they are dead. But it didn’t take me long to get over that, mostly because she kept saying it over and over. And again I was struck by what the Yiddish call her chutzpah and her honesty and humility. Read Victoria’s Travel blog http://itafari.org/discuss/ from her most recent trip to Rwanda.